Body Cam Study Shows No Effect On Police Use Of Force Or Citizen Complaints : The Two-Way That's the conclusion of a study performed as Washington, D.C., rolled out its huge program. The city has one of the largest forces in the country, with some 2,600 officers now wearing cameras. D.C. Master Patrol Officer Benjamin Fettering shows a body camera worn in place of a normal radio microphone before a news conference in 2014. "We found essentially that we could not detect any statistically significant effect of the body-worn cameras," says Anita Ravishankar, a researcher with the Metropolitan Police Department and a group in the city government called the Lab @ DC. "I think we're surprised by the result. I think a lot of people were suggesting that the body-worn cameras would change behavior," says Chief of Police Peter Newsham. "There was no indication that the cameras changed behavior at all." Perhaps, he says, that is because his officers "were doing the right thing in the first place." In the wake of high-profile shootings, many police departments have been rapidly adopting body-worn cameras, despite a dearth of solid research on how the technology can change policing. "We need science, rather than our speculations about it, to try to answer and understand what impacts the cameras are having," says David Yokum, director of the Lab @ DC. His group worked with local police officials to make sure that cameras were handed out in a way that let the researchers carefully compare officers who were randomly assigned to get cameras with those who were not. The study ran from June 2015 to last December. "This is a very methodologically rigorous study. It is very well done. And that's not a small issue, because there have been many studies of body-worn cameras that are not rigorous," says Michael White, a researcher at Arizona State University who has studied body-worn camera programs in Tempe, Ariz., and Spokane, Wash.
"They're hiring the right people; they've got good training; they've got good supervision; they've got good accountability mechanisms in place," White says. "When you have a department in that kind of state, I don't think you're going to see large reductions in use of force and complaints, because you don't need to. There is no large number of excessive uses of force that need to be eliminated." The big question about cameras now is, White says: "Is it worth the cost?" Besides buying the actual cameras, cash-strapped police departments have to pay to store and manage many thousands of hours of video footage. "I think a big part of the answer to that question is going to come from what the police department and the community want to accomplish with the rollout of body-worn cameras." 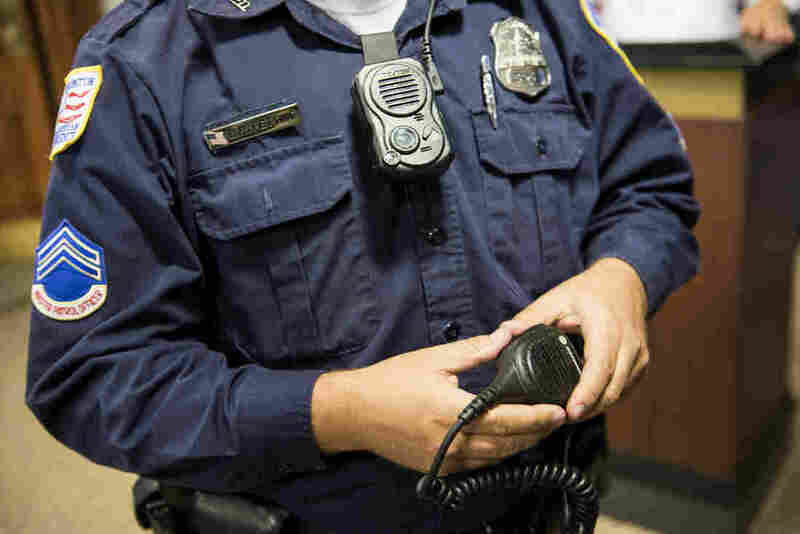 The results of this study call into question whether police departments should purchase body-worn cameras at all, says Harlan Yu, who works for an organization called Upturn that studies how technology affects civil rights and social justice issues. "This is the most important empirical study on the impact of police body-worn cameras to date," Yu says. "If cameras don't decrease use of force, don't decrease the number of misconduct complaints and don't change officer behavior, then what are we adopting cameras for?" He notes that a lot of recent footage showing police violence has come from bystander video, not officer body cameras. And while cameras have had neutral effects in Washington, D.C., Yu says the devices might have harmful effects in places with policies that, say, allow officers to review footage before writing their initial reports of violent incidents. Despite this study's results, the nation's capital has no plans to get rid of its cameras, according to Newsham. "I am a little concerned that people might misconstrue the information and suggest that the body-worn cameras have no value. I don't think that this study suggests that at all," he says. In his view, the cameras have helped his department enormously after contentious encounters like a recent one on Christmas, when police officers fatally shot a man who was brandishing a knife. Some had suggested the man was not armed, but Newsham says the video shows otherwise. "I think it's really important for legitimacy for the police department," says Newsham, "when we say something to be able to back it up with a real-world view that others can see." D.C. Mayor Muriel Bowser says in a statement that the city "invested in one of the most comprehensive deployments of body-worn cameras in the nation to ensure even greater transparency and accountability. As we conclude this comprehensive study, we will recommit ourselves to always evaluating what works —and what does not— to better serve our residents and creating a safer, stronger DC."